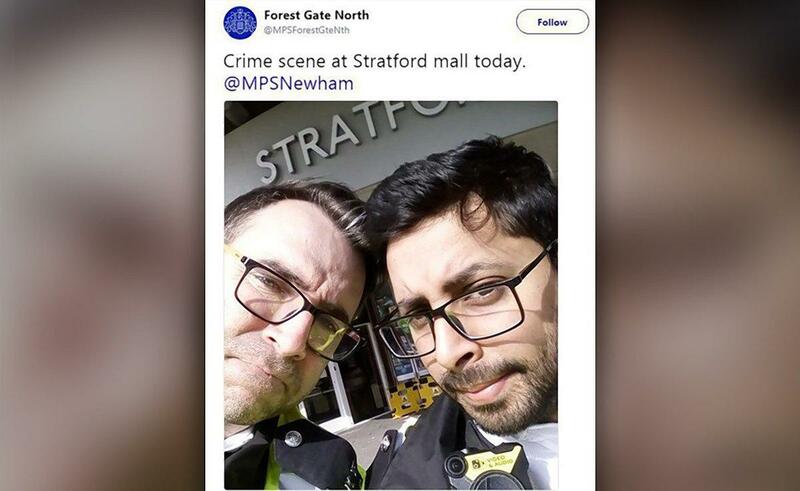 The Metropolitan Police apologized after two of its officers shared a selfie taken at a murder scene in Stratford, sparking public outrage. Two Forest Gate North police officers posed with their heads together in front of the Stratford Centre in east London, captioning the snap, “Crime scene at Stratford mall today. According to reports, the officers were guarding a police cordon outside the centre where Beniamin Pieknyi, 20, had died in his friend’s arms after being chased and stabbed by a gang in the shopping centre on Wednesday night. He had reportedly stepped in during an altercation to help his friend. Scotland Yard subsequently took down the image and apologized for the insensitive selfie. “We apologise for any offence caused by the ‘selfie’ picture that was posted from the scene of a serious crime this morning. The officers showed a lack of judgement and sensitivity in posting this and they will be spoken to and reminded of how to use social media responsibly,” police tweeted.